Aging is a complex process involving lots of different mechanisms. One of the main processes on which aging is based is the formation of reactive oxygen species (ROS). ROSs are molecules formed as a result of a sequential one-electron reduction of oxygen. They are extremely chemically active and oxidize many compounds inside the cells. This leads to malfunctions in cellular molecular mechanisms and eventually to cell death. ROSs are frequently formed in mitochondria—the power factories of the cells. Mitochondria-targeted antioxidants, including SkQ ions, affect mitochondria directly and prevent the synthesis of dangerous molecules. Their action mechanism is not completely clear yet, but scientists believe it consists of two parts. The first one is a chemical reaction of SkQ with ROS or their products. The second is implemented due to the reduction of transmembrane difference of electric potentials in mitochondria which suppresses the formation of mitochondrial ROS. A team from the department of immunology (Faculty of Biology, MSU) tested the effect of SkQ mitochondria-targeted antioxidants on plant cells. The main target of the study was to determine the influence of these substances on chloroplasts in which photosynthesis takes place. The scientists demonstrated that in nanomolar concentrations, SkQ suppressed the death of plant cells caused by the influence of poisons in pea leaves. In micromolar concentrations, the antioxidants slowed down photosynthesis in chloroplasts and stimulated respiration in mitochondria. 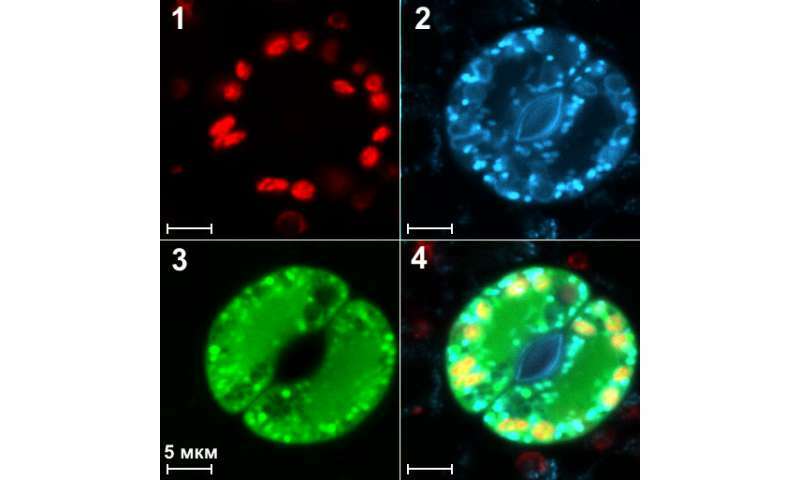 The team also found out that SkQ antioxidants slowed down the senescence and death in the leaves of Arabidopsis thaliana, a plant from the Cruciferae family. "An important moment for us was finding that these antioxidants contain plastoquinone from plants, namely from chloroplasts that capture and convert the energy of light into a form that is accessible to plants. Therefore, we needed to study how these compounds would influence plant cells and interact with chloroplasts," explained Dmitry Kiselevsky, a co-author of the study and a senior researcher of the Faculty of Biology, MSU. "The research of mitochondria-targeted antioxidants studies the role of mitochondria in the formation of ROS, as well as the programmed plant cell death. Currently our lab is working on the role of another energy exchange system (glycolysis) in the formation of ROS in plants," added Dmitry Kiselevsky.